Big drama to start our Friday morning - Ian tried very hard to separate his index finger from his hand when washing a glass and the kitchen looked like the scene from a chainsaw massacre. Off to emergency at the hospital - 4 stitches later back home. 7.30am is a good time to go to emergency - apparently all the regulars don't wake until 11am so it was nice and empty and we even got a park outside the door. Of course it threw the day into chaos and he has had to be a bit spoilt etc. 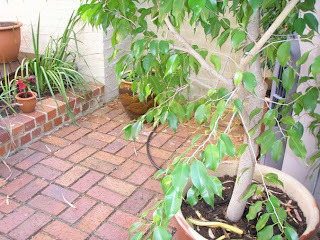 He would not let me take a photo of his finger so I have posted some pics of our favourite little garden area where we like to sit in the evenings (I expect this pleasure will be denied to us next year when daylight saving disappears since it seems we are indeed a minority who enjoy our evenings in the garden) . In the corner of the top pic is the waterliliy where a new flower is starting to poke its little head up. I think I have finally solved the problem of the binding for my next rust book - I shall put it together tomorrow I hope. In this household we just LOVE daylight saving. We love not being woken up at 4.30am when the sun comes up and we LOVE being able to relax outside in the evenings enjoying our environs. We LOVE to have a barbecue, read our books and enjoy our garden. We do NOT want to have the lights go out at 7.30pm in the Summer. We just hope all thinking West Australians support the referendum on daylight saving. Otherwise just how backward can we be? 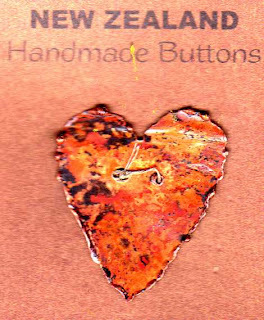 Look what the courier man brought today - a huge box of handmade copper buttons. Little and big square and round and hearts. I have nabbed some little square ones for my new rust book which is nearly finished - just making the rods for the ends. Very exciting to get these - Ian will do much nicer pictures for the website tomorrow I hope. If you only knew how long it took me to track them down and as usual all for my own selfish use - but willing to share them with everyone else of course! They are all beautifully hand made - quite yummy. By the way - all bar 3 of the books have gone. I do believe I will have some more to come before too long. 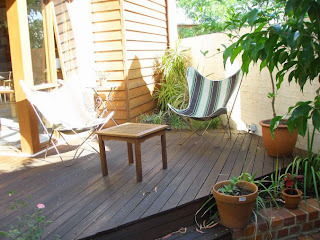 It's Australia Day today - Ian has stained or whatever you call it, all the decking so it's very smelly out there. We are, of course, having lamb on the barby - French cutlets marinated in a yummy spice mix with salads and I have been cleaning out some more and have another pile of books to give away. You just have to pay the actual postage which is probably a red postal bag. all good books - all out of print but much nicer to go to new homes where they will be read and enjoyed. Just email me if you are interested. 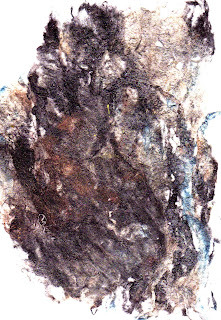 We have had quite a relaxing day today - watching the Australian Open, going to get plants and stuff and walking up the road for coffee and I have been working away on the next Ratty Tatty Papers lesson with my favourite fabric - Tissutex - here is a playing with silk fibres bonded to Tissutex the medium method. I still have to stitch on it but the fact that Tissutex has wet strength means it can take water without a worry - it is a conservation paper and then it is great to stitch into. I scanned it but at some stage I will do some photos. The middle part is the straggly sericen fibres and the outsides are noils - I have sort of half sprayed them with soem colour - needs further attention. I also made a little off-beat hexagon book - no point in being perfect in your shape. There is nobody much around - I think they have all left town for the long weekend. 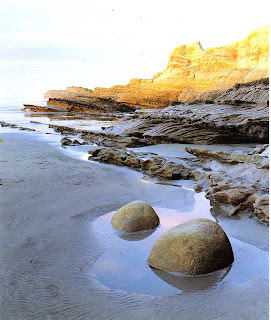 We love it when there are long weekends as it is nice and quiet without much traffic or people. I know you wil all be excited to hear that the rugby season has started. Well actually only the preseason games which don't mean anything. Last night the Force vs Crusaders at Perth Oval - our local park - there were over 18,000 people there - sold out. I hope this send a very clear signal to the powers that be that we don't want to go to Subiaco Oval - we want to see our favourite rugby guys just a few doors away from our house - we had a bbq beforehand - one of Ian's specials - for the gang and a few extras. The Crusaders won. On April 10th my beloved Hurricanes are playing in Perth but I am not going because it will be at Subi Oval and you can't see the action. So we will wacth it on the big screen at Bruce and Kaz's place. I have started my Stone book (when I should be doing something quite different) but couldn't resist making my first book page using silk paper made with cocoon strippings - plus Starburst Sprays twin needling with one supertwist thread to give that reflection you often see in nature and some hand stitching. A good start I hope. I have also been making easy peasy silk paper for another rusty book - no pockets just pages. Show you when I have finished it. 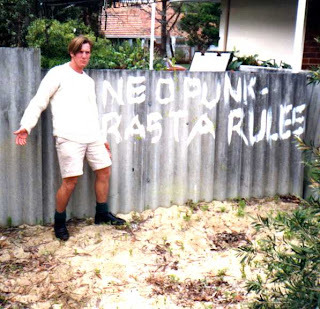 Long weekend this weekend due to Australia Day on Monday. Don't forget the lamb on the barby. 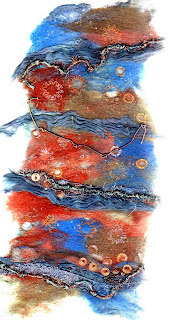 Jacinta has been dyeing up a new fibre - see my stone pictures below - Stonehaven - today she sent me silk tops, wool tops, filmsies and a pile of fibres so I have been making silk paper from the cocoon strippings and spraying it with Starburst Sprays. 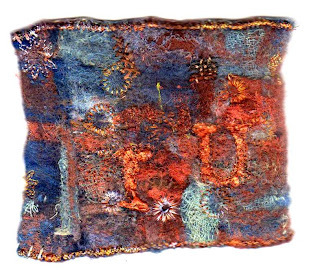 I am planning a new little book - my stone book - the pics are not such a good colour but you can see the colour of the fibres on our website for a better colour. Anyway the book will grow slowly or so. 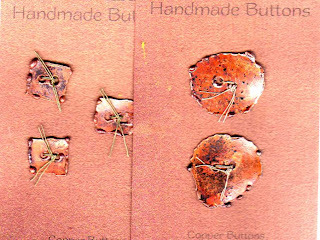 I finished my Rust Pocket Book today - and I even found my rusty buttons I bought from Christopher Robyn Quilts in Wanaka - thought they had disappeared. I don't finish these books to a pattern - I just hope that somehow they might end up how I like. I should have photographed it -I just scanned it and the edges are pretty blurry. This is the outcome from having my sample book stolen - new experimenting with loved theme and full of flower stitches in various sizes and patterns. 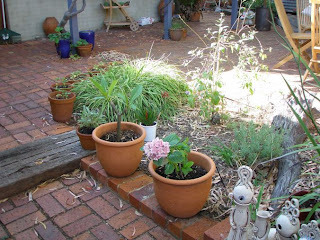 I have been very busy this week with 2 on-line classes starting. For Ratty Tatty Papers which began on Wednesday I had naturally left the last touches until the dead knoll so there we were on Tuesday night frantically coordinating words and pictures - good excuse to go eat a curry at GoGos at 9.3opm. After so many years of just touching deadlines it seems hard to change my spots. 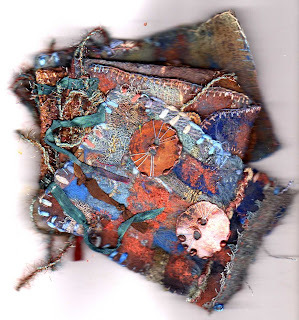 I have posted to my Ratty Tatty Paper blogspot and will do so again tomorrow. This lovely book arrived yesterday - I have just finished reading January. 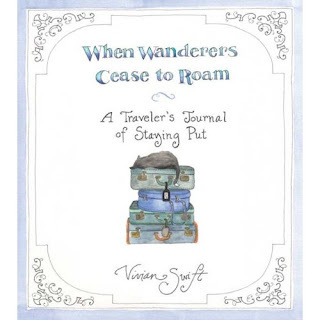 I am not sure if I really ever want to cease to roam though. It's stinking hot again and not much sign of the sea breeze. We had a lovely bbq down by the river last night with Val and Jim - very still, peaceful and emjoyable. page 3 of my rust pocket book - lots of stitching later - but I am pleased because it has that old rusty at the yacht club look. 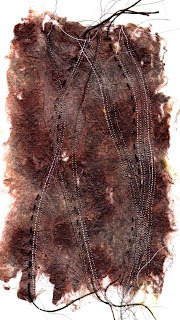 I am not sure why I stitched with a variegated thread though as by the time I attacked it with my heat gun, sprayed with Moonshadow Mist and rubbed with Shiva it didn't really matter..... 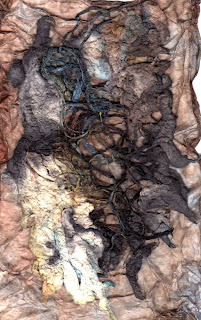 I should have photographed it really as it is hard to see the texture. The biggest excitement is the communication I have been having with my Moonshadow Mist manufacturer - I love the Starburst Stains but I don't like the daubers so she is making them with sprays and they are changing their name to Starburst Sprays - that's wonderful - what I do do is to use the tops from my used up Mists on the SS bottles. They have such wonderful colours and the very best part is that we are not paying for water to be sent around the world - we just add it at home. Glory are playing down at the Perth Oval and I think from the noise that they are winning. Be a happy crowd tonight at the end of a very hot day. 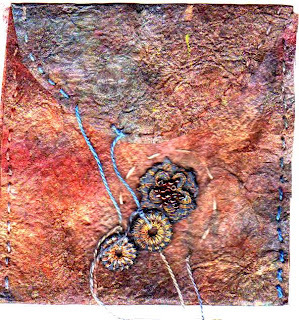 Embellish Stitch Enrich on-line workshop starts tomorrow - I am looking forward to seeing what wonderful work they create. Ratty Tatty Papers starts on Wednesday but I am still playing with paper napkins - will have to stop tomorrow though. gold, lime, lavender, orange, black, peach, fuchsia/gold, ivory, purple, green/gold - the colour above is fuchsia/gold. It comes approx 75cm x 53cm and is $4.00 a packet with notes. 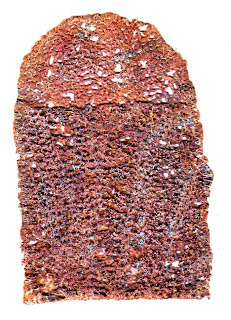 My explorations - well I have sitched on it, trapped things inside using the embellisher, heat gunned it, manipulated it, layered it and heated and as I also have magic wiggley mesh in red and lime green, I have been trapping this inside too. The wiggley one is $3.50 a piece and again I have been looking for other colours but no luck yet. You can order it from us - but don't look on the web for it yet. Today Ian made me stand outside in the hot sun holding the roll of white fabric over the silk fibre basket so he could photograph it - so now you can see the silk by the fibre - that is on the web. We shall collapse tonight and go eat salt and pepper squid at Koinonia. Pam has sent me pics of her Dorset buttons - aren't they wonderful? I have never made any but I can see it mentally on my list. The top one is made with crystals. Thanks so much for sharing them Pam - the 'net means we have access to each other's creations although a plane trip to the northern hemisphere would never be lost on us even though Grant tells me it is very cold in London. Growing up in NZ I love cold nights and frosts - didn't have snow but I used to sleep with the windows open (and be told off by my mother) and in the morning there were icicles hanging around. Well in Perth it is very hot and we are hiding indoors with the air con on - thank goodness for the air con. I have also hear it is extremely hot in Wellington and Christchurch but not so in Canada. Someone told me that if you wear your glasses to the bus stop they will freeze on your face. The mind boggles. We had a lovely night last night - late bbq and sat outside reading etc. As still as can be. I LOVE daylight saving. Book page 3 is nearly stitched so I can attack it with my heat gun and see what happens and my paper napkin book pages are all done - just the cover to start on. - Susan Lenz has done the most incredible job. I only wish I could go see in person. Well the free books have been very popular -I haven't put the gone on the last few but I do have people wanting them - just waiting to hear back. I am glad they are all going to good new homes. I have actually found a few more but I will keep them for a week or so. How's this for a family photo? 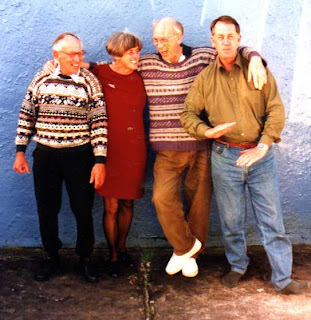 Max, Annette, Ian and Ken - now who looks to be the most frivolous? I cannot imagine. On our website we are having a Big Book Clearance Sale and here on my blog I have books to give away. If you are in Perth and want to come and collect feel free but if you are somewhere else you will have to pay the actual postage (or they can be included in with your normal order of course). I have decided that 2009 is my year to do some culling with a bit of the use it or lose it atmosphere. I really am trying to isolate my interests - ha ha - but I do know that I have moved on from some things - it may be that I never moved into them, just bought the books. So here is my list - email me if you want any of them. They are all good books in good condition. and I have 2 thrfold 1 journals - all the pages are there but some are upside down but if that doesn't worry you then it's okay. They both have the cds included. I also have my Husqvarna Orchidea sewing machine for sale. It is a fabulous machine with all sorts of extras - embroidery unit, many feet etc but I will never use it as I have my lovely Designer SE. I do want $500 for it though in cash and I will have it serviced with David from Bestway in Willetton for whoever buys it. No offers - I will keep it if it doesn't sell. Bruce and Kazuko - west runs into east yet again. Doesn't Kazuko look wonderful! 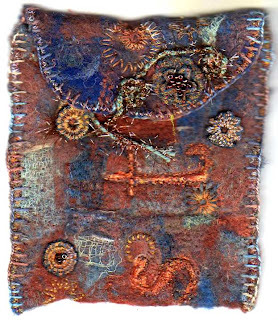 Some rusty stuff today - I have made quite a number of different 'fabrics' and woven and patched some - this above is the first page for a new little book. A lot more work to come of course. 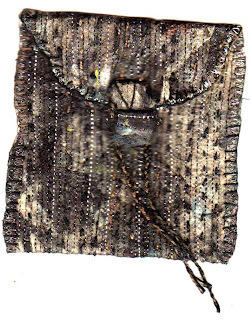 L still like this cutting, weaving and reconstituting. This is a side track while I was playing but it is inspired by my trip to the yacht club to take lots of photos of the rust and poles etc. The blue in my scan is much too blue - but you get the picture. 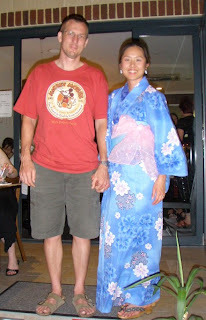 Tonight we are off to eat at Koinonia with Bruce and Kazuko - New Year's Day is big in Japan and Kazuko will be wearing her kimono. I will take the camera. 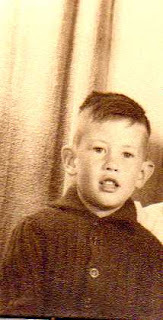 Happy New Year everyone but especially Happy Birthday to Ken - being born on the 1st of Jan means Ian never forgets..... We hope you and Raylene have been having a wonderful day in Pukerua Bay. 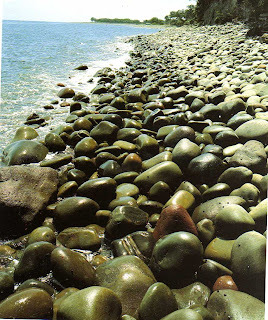 Very hot here but I have been creating - come back and see later on today. Went to the studio to do something else but felt inspired to create some fabrics for a little book I am going to make and got inspired by the pics I took at the yacht club a couple of weeks ago.